INTRODUCTION: Currently, there is no ideal specimen retrieval bag for NOTES. 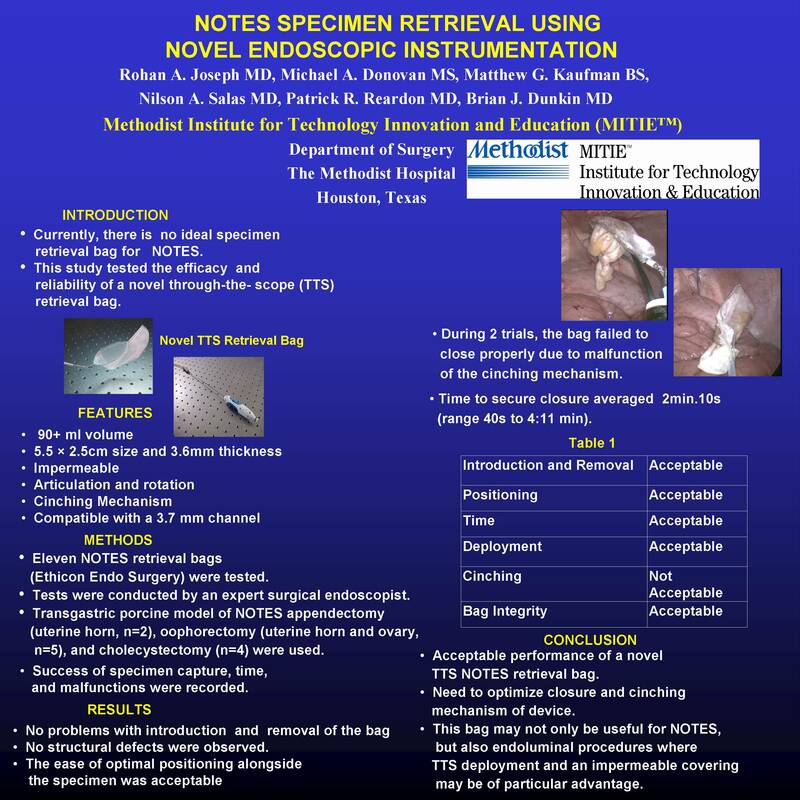 This study tested the efficacy and reliability of a novel through-the- scope (TTS) retrieval bag. METHODS: Eleven NOTES retrieval bags (Ethicon Endo Surgery) 5.5×2.5cm in size and 3.6mm in diameter were used for these experiments. The impermeable bags have a 3.5cm wire-supported articulating/rotating opening with cinching mechanism. Tests were conducted by an expert surgical endoscopist using a transgastric porcine model of NOTES appendectomy (uterine horn, n=2), oophorectomy (uterine horn and ovary, n=5), and cholecystectomy (n=4). Success of specimen capture, time, and malfunctions were recorded. RESULTS: There were no problems with introduction and removal of the bag and no structural defects were observed. The ease of optimal positioning alongside the specimen was acceptable utilizing the articulation and rotation features and all specimens were captured successfully. Time to secure closure averaged 2min.10s (range 40s to 4:11 min). During 2 trials, the bag failed to close properly due to malfunction of the cinching mechanism. Both trials were salvaged using the flexible grasper. CONCLUSION: This study demonstrates acceptable performance of a novel TTS NOTES retrieval bag. Further work is needed to optimize closure and ensure consistency in manufacturing this prototype device. Such a bag may not only be useful for NOTES, but also endoluminal procedures where TTS deployment and an impermeable covering may be of particular advantage.